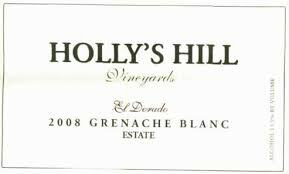 When you find a good wine, such as this Hollys Hill Grenache, it never hurts to revisit it, especially when it’s buried in the past. We had been invited to a friend’s home for dinner. I always like to take a gift, so I went rummaging around for a white and red wine to take along for the hostess. Hollys Hill Grenache was the red wine I decided would be a good choice. I thought it would go well with the menu. It turned out to be what was needed to add a spark to the table. A love affair with the Rhone varietals started when Tom and Holly Cooper shared a bottle of Chateauneuf du Pape while on their honeymoon in the French Rhone Valley. So it’s no surprise that in 1998 the Coopers and their daughter, Carrie Cooper Bendick, planted their first vines with grapes that closely mirrored the Rhone Valley varietals. 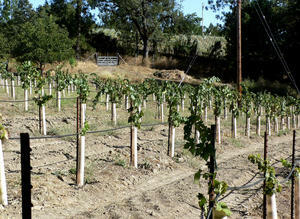 Hollys Hill Winery is located in the Sierra Foothills of El Dorado County and the Pleasant Valley in California. They continue to specialize in producing Rhone varietal wines. In fact, the estate vineyards are composed entirely of Rhone varieties including Viognier, Roussanne, Grenache, Mourvedre, Syrah, and Counoise. The winery produces Rhone style varietal wines that include red and white blends and a dry Rosé. You can relax in their charming wine tasting room and enjoy some of the most incredible views of the valleys and river canyons below, all while sampling a variety of Rhone style wines. “Grenache wines denote bright red fruits such as strawberries and cherries dominate the aromatics of this lighter red wine. It can be very round in the mouth, however, with firm tannins. Spices such as licorice and pretty aromas of lavender and other flowers can also add to the finesse of this wine. Because it is a small boutique winery, the only way you can purchase their wine is at their tasting room or on their website. I had visited Hollys Hill Winery a while back and bought this wine while at their fabulous tasting room. It had been in my wine chiller ever since. It was an excellent wine to have with our dinner, and I regretted not indulging in it sooner. If you enjoyed reading about Hollys Hill Grenache, check out Mark West Pinot Noir, Mirassou Pinot Noir, and Bogle Winery Cabernet Sauvignon.